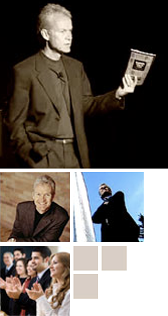 David Irvine offers a wide range of products and services, from best-selling books, to life-changing personal and organizational coaching, to acclaimed keynotes presentations, workshops, and retreats. When you work with David you get results. See how others have benefited from working with David: Client List and Testimonials. David’s presentations and workshops provide inspiring, engaging, and results-based learning experiences. The topics listed below can be adapted to a keynote address, a three-hour seminar, a one-day session, or a three to five day retreat. Every event is uniquely tailored to the specific audience he is addressing. Just as no two audiences are the same, no two of David’s presentations are the same. David’s flexibility means together you build a customized life-changing development experience that goes beyond traditional “leadership training” so the event is relevant, meaningful, practical, and entertaining. Send David’s team an email on his contact page and we will work with you to explore how he can assist you. This will include a complimentary half-hour chat with David.